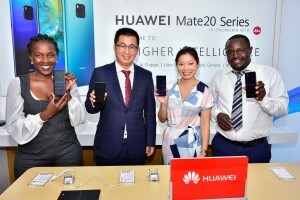 NAIROBI – HUAWEI has unveiled the much anticipated Mate 20 Series to users in Kenya. He said consumer expectations were rising, hence in the race to bring the best Android smartphone to market, Huawei was leading the rapid development of technologies that helped improve device performance. “The Huawei Mate 20 Pro offers consumers a compelling combination of high performance, longer battery life, advanced security and a greater photography and videography experience through its Leica Ultra-Wide Angle Lens camera,” Li said. “Powered by its own in-house designed Kirin 980 AI chip, this advanced chip is fabricated with leading 7nm process technology, packing 6.9 billion transistors into a form factor the size of a fingernail,” said Li. The Huawei Mate 20 Pro is equipped with a 40MP main camera, a 20MP ultra wide-angle camera, and an 8MP telephoto camera. Introduced globally in November, the Huawei Mate 20 series offers a compelling combination of powerful artificial intelligence (AI), flagship performance, longer battery life, advanced security, a greater videography and photography experience, according to the company.